26 people have been killed after a gunman opened fire at a church during Sunday services, police say. Wilson County Commissioner Albert Gamez Jr said the gunman fled the scene in a vehicle before being killed. "You never expect something like this. My heart is broken," Mr Gamez Jr said. About 50 people usually attend the service, locals said. The BBC's James Cook reported that children were among those killed. Pomeroy, who was out of town in Oklahoma at the time, described her as "one very beautiful, special child" in a phone call to the television outlet. "We were in the middle of our church service down the road when we got phone calls from friends about this - and they said there was an active shooter at First Baptist Church," he said. "We had some first responders in our church, who immediately left and went down there. And then my church went to do what we do - we started praying… we knew the best thing we could do was stay out of the way". He said people had been told some news which was "private and personal for the families that are here… we cannot release any of that". 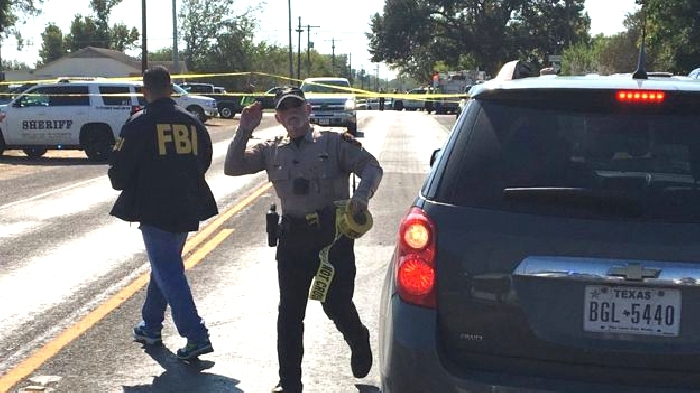 Sutherland Springs is a small rural community with just a few hundred residents, which lies about 30 miles (50km) southeast of San Antonio. The San Antonio FBI branch said its agents had been deployed, and there was no indication of the gunman's motive. Texas governor Greg Abbott said: "Our prayers are with all who were harmed by this evil act. Our thanks to law enforcement for their response." President Donald Trump, on a tour of Asia, tweeted he was "monitoring the situation from Japan".